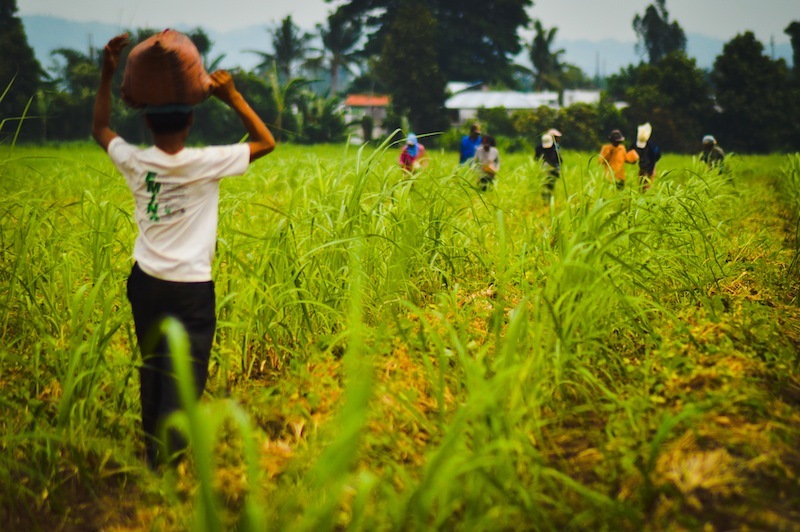 In the summer heat, young children were seen working Ormoc City's sugarcane plantations. They wore a pair of old socks and slippers, long sleeves and a piece of cloth to protect their heads against the heat of the sun. Thirteen year-old Pauline (not her real name) has her own “machete” (the sharp bolo that is used for cleaning the sugarcane plant). She spent the whole summer season working in the fields and was paid only 110 Philippine pesos (just over 2 U.S. dollars) a day. Her father is a construction worker while her mother -- a former housekeeper -- can no longer work after undergoing a caesarean operation when she gave birth to her third child. Pauline, a sixth grader at Cagbunhangin Elementary School, says that there are days she has to leave class to help her father earn enough money to feed their family. All the money she earned from working in the plantation this past summer was given to her parents. Often she goes to school without any money to buy lunch. “Kadalasan wala po akong baon, ibinibigay kop o kasi sa mga magulang ko ang kinikita ko para sa pambili ng pagkain namin,” she says. Working in the sugarcane plantations has never been easy for her. “Mahirap, mainit, marami akong sugat dito sa kamay at sa paa. Napapagod na ako. Wala naman po kaming magawa, gusto ko pong tulungan ang pamilya ko,”she added. When she was younger, Pauline dreamed of someday becoming a caregiver and working abroad. Like her, 11-year-old Jose (also not his real name) was determined to finish his studies and worked in the plantation alongside Pauline. His father is a former sugarcane farmer and his mother also works in the field. Their family home, which had been destroyed by Typhoon Yolanda (Haiyan) has yet to be rebuilt. His family, like others in the region, is still waiting for emergency shelter assistance from the Department of Social Welfare and Development (DSWD). Jose started working in the plantation at the age of 10 and works in the field three days a week, sometimes more if needs be. Despite the hardships his family has endured, Jose dreams of working in a bank someday. “Gusto ko magtrabaho sa bangko, kasi maraming pera,” he says with a smile. A large number of child labor cases have been recorded in the Northern Samar province, particularly in the municipality of San Isidro where many children spent their summer vacation helping their parents work in the quarry site along the National Highway. This extra income helps to support their education and daily needs. Children as young as 7 years-old were seen working in the quarry sites smashing rocks into small pieces of gravel to later be sold to some contractors for 13 Philippine pesos per sack. By six o’clock in the morning, children and more than 25 families rely of the sale of gravel to cover their daily expenses were already in line to start their day. Jovelyn Lacandazo, a 33-year-old mother of three, agreed that the children were working in a risky environment, but confessed that they have no choice because they need the extra income to survive. “Oo delikado, syempre. Hindi lang sa mga bata kundi sa mga matatanda rin tulad namin. Kasi maraming beses nang napukpuk yung mga daliri ko at napuwing ng maliliit na bahagi ng bato ang aking mga mata. Eh sa mga bata pa kaya, Dyos na ang bahala sa amin,” Lacandazo said. Marilyn (not her real name), who is 13 years-old, works every day in the quarry site to earn money for school. She wants to be a teacher. Her parents farm a small portion of land located a few kilometers away from their barangay or village. 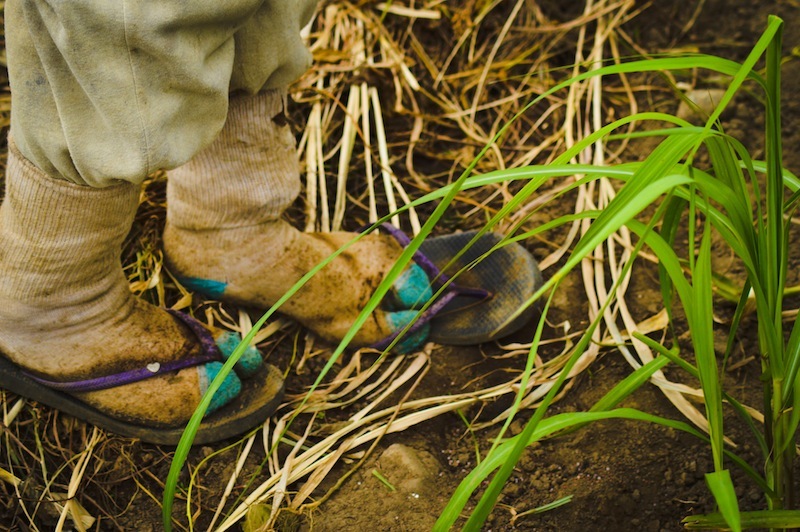 Joseph has been working to supplement his family's income since he was seven. At the age of 12, he was still in his third grade because he had to stop his schooling to prioritize helping her mother put food on their table. The work is taking a physical toll. At 12, his young body already shows his tired muscles. Joseph and his mother can produce up to five sacks of gravel per day, but there are times that no contractors will purchase it. Last 2013, the Department of Labor and Employment implemented a four-year program to minimize the child labor cases in the villages of Eastern Visayas. The office recorded child labor cases in 22 areas of Mondragon, Catarman, Laoang and Las Navas in Northern Samar as well as in Tacloban City and Ormoc City in Leyte. The four-year program aims to save at least 75% of 213,000 young workers in the region. Of the total, 159,750 are engaged in hazardous work. Their assessment showed that children in the region are engaged in pedicab driving, child trafficking, child prostitution, domestic work, farm labor, quarrying, garbage collection, deep-sea fishing, passenger vehicle and motorboat crew, and vending. Meanwhile local labor groups say there was an increase in child labor cases a year after Typhoon Yolanda. Of the six provinces in the region, the province of Northern Samar, which has been considered one of the poorest provinces in the country, 14 villages had existing child labor cases. The second highest is Leyte province, particularly in Ormoc City where big haciendas are located. Here, many children work in the sugar plantations. The authorities also cited the existence of child labor cases in the Poblacions in the provinces of Southern Leyte, Samar, Eastern Samar and Biliran. In Tacloban City, child labor cases were recorded from the four biggest barangays namely Barangay 37, Seawall District, Barangay 106 Sto. Nino, Barangay 1 and 4, which is located near the port area. Recently, two minors working in a construction site in Cebu City were rescued by the authorities. According to Nia Chua, from the Department of Labor and Employment, the two minors fled to Cebu City last 2014 after Typhoon Yolanda hit Eastern Visayas. In Cebu City, an employer hired the minors for a masonry job that paid below the minimum wage. They accepted the job offer because of the difficulties faced by their families after the disaster. They were later sent home to Balanginga, Eastern Samar. “Basta yung pagkakaalam ko base doon sa mga bata ay nagtrabaho sila sa Cebu ng sobrang hirap ng sitwasyon nila matapos ang Yolanda,” Chua added.